Yesterday, Charlie and I set off from home at 6am and headed to Silverstone. To my surprise there was no traffic whatsoever. We arrived at about 7.30, parked up and entered the circuit at gate 9. The place was already full of the general admission holders, grabbing the best position possible next to the track. Charlie grabbed some earplugs and a map, and he managed to work out where we were and where we had to get to. Before making the walk down hanger straight, we grabbed a Sausage and bacon cob plus a cup of tea. Normally the food at these places are rubbish and overpriced! This was lovely! We headed down the straight and we noticed the amount of helicopters coming in, Silverstone must have been one of the busiest airports yesterday. With lines if choppers in the sky waiting for landing clearance. We walked towards our seats at Stowe and worked out where we needed to sit later on, because we were so early we decided to carry on walking round. Just behind Stowes was one of the 3 E-Arenas, a family entertainment area with free activities for the kids. Charlie was eyeing up the bungee trampolines and a spider climbing frame tunnel, but as it was pre-8am it wasn’t yet open. 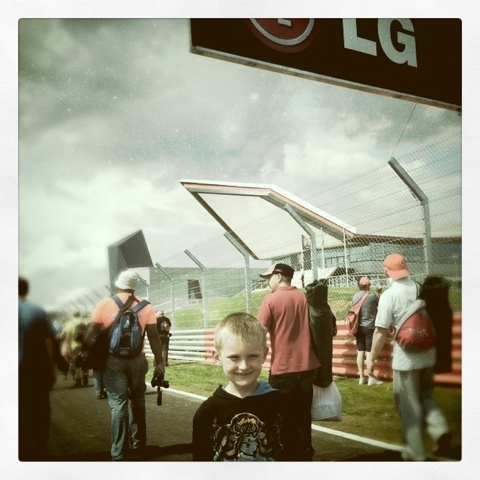 I’m even more excited now that I actually have my tickets for the British Grand Prix on Sunday at Silverstone. Nice 6am start on Sunday as I’ve heard the traffic on the A43 was very bad this morning. Although I’m not sure I’ll stay much longer after the F1 race because of Charlie. Got to say a massive thanks to Jamie Davidson at Sunwin Renault Mansfield for letting me have them!